How to use an offset smoker and an electric smoker? How Offset Smokers Work and Advantages of Offset Smoker? How to Set Up and Modification Offset Smoker? How to Take Care of and Clean Your Offset Smoker? Offset smokers are one of the commonly used barbecue smokers. They are also known as barrel smokers as it contains two barrel-like horizontal structure, one bigger than the other, attached side by side. The bigger barrel of this traditional smoker is used to place the pieces of the meat to be cooked at low temperature. And the smaller barrel is used as its firebox that transmits heat and smoke to the lager barrel to cook as well as smoke the tender pieces of meat. Wood or charcoal is burnt in the firebox of the offset smoker. In order to send the heat and smoke forcefully into the bigger barrel the firebox is fixed with at a bit lower level or offset to the center of bigger one. In this way, an offset smoker can cook your meat by transforming heat and smoke from smaller chamber to the bigger one and retaining the smoke in it before it goes out of through the chimney. In order to regulate the temperature in the offset smokers you will have to adjust the intake and exhaust of the air in it. The fire will burn faster and hotter if the air intake is increased and vice versa. While buying an offset smoker you should consider some of their features and several other things. Some people focus on size, style and price of the offset smoker while buying one for their personal use. They focus on the size and shape of the smoker to match it with the decor of their home, but its price should not be the main criterion to choose the best one. You can find the best offset smoker under 500 as well as offset smokers under 1000 on online markets. This difference in their prices depends on their features. Some of the features that can change the price of your offset smoker are discussed in brief here under. The gauge of the metal sheet used to make the offset smoker should be higher to provide an evenly cooked food by retaining more heat. Normally ¼” sheet is used for this purpose as it is less affected with weather changes. But thicker sheet used in it will not only increase its retention power but also its price. In order to control the temperature efficiently, the seals of your offset smoker should be of high quality. It will reduce the usage of fuel along with improving the retention of smoke. So, you should check the seals of your offset smoker along with its damper. But the damper seal should allow it to slide easily to open and close the smoker. It will allow you to measure the internal temperature of your smoker without opening its lid to cook your meat perfectly at the right temperature. So, you should choose one having a temperature gauge on either side of the main chamber to adjust its temperature uniformly if there is any difference. Although it can increase the price of your smoker, it will also provide the best cooked meat to eat. The legs, latches, hinges, and wheels of your offset smoker should be strong enough so that you can use it for a long time without bothering much for its maintenance. Some of the manufacturers provide waterproof cover to store your offset smoker when not in use. It will increase your cost if you have to buy the cover separately. However, it is a good investment as it prevents rusting of your smoker, especially in wet weather conditions. Most of the manufacturers offer a lifetime warranty to ensure the quality of their offset smokers. Although this warranty increases the price of your smoker, it also provides you with peace of mind in case manufacturing defects come to your notice later on. The size of the firebox of your offset smoker should be large enough so that you can use different types of fuels like a wood chip, split wood, logs, or charcoal in it as source of heat. While buying an offset smoker you should know how big its cooking chamber should be to allow you to cook enough meat or other foods for your family. It should have enough space on its racks along with enough number of hooks to cook the sensible amount of food at a time. You can use it in a more flexible manner if it has removable racks. You should also consider the amount of space you can spare to put your new offset smoker at your home. The offset smoker you choose should have removable cooking plates, a drain plug, and an ash cleaning tool so that you can clean it easily after every use. Easy scrubbing your smoker can not only save its life, but also provide you with more hygienic food every time. Though your smoker should be made of quality materials, it should have a wheel and handle so that you can move it easily wherever you want to barbecue foods of your choice. You should also check the accessories provided with your offset smoker as they can make your cooking easier. Racks, tools, weatherguard, and rib hooks are some of the standard accessories provided with new smokers. Thus, after considering all the things and features discussed above, you can easily find the offset smoker for sale and buy the best smoker for your home. Buying the top offset smoker can often become a tedious task owing to a large number of choices available. They also come in different sizes, shapes, and kinds along with offering a multitude of varying features. This makes it even more difficult to zero in on the perfect smoker for your homes. Discussed below are some of the best grillers and offset smoker of 2017. 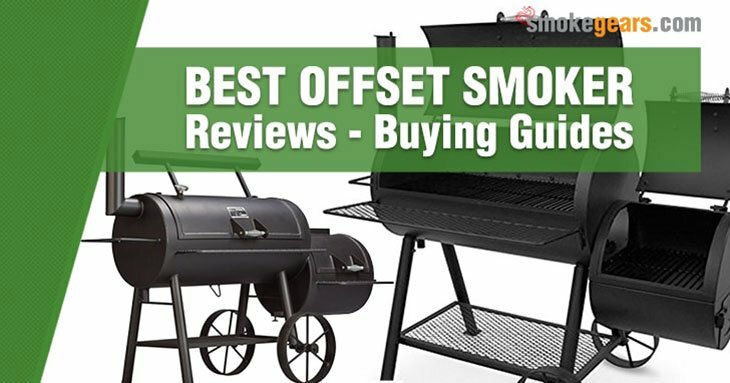 These reviews of some of the best horizon offset smoker should be able to help you choose the perfect smoker for your home. Char-Broil has introduced American Gourmet offset smoker in three models – standard, deluxe, and deluxe with charcoal starter. All of these models can be used as charcoal grill and BBQ along with an offset smoker. The cooking surface of the main chamber of its standard model is 290 square inch and its firebox is 140 square inch. The height of its fire grates made of steel is adjustable. It is provided with a clean outdoor and a built-in adjustable damper to remove ash from the firebox easily. If you want to cook smoked meat perfectly, you can rely on this durable offset smoker. The easy to access drawers of this smoker makes the feeding process of wood chips and water easier. The structure of this offset smoker is stable and sturdy due to the square legs made of steel. In order to provide you most flavoring foods, it is provided with a welded cooking chamber to keep the smoke inside it. In order to control the heat in the cooking chamber, this strong and reliable smoker is provided with a fully adjustable temperature control system. A vent chimney is provided at the top of Char-broil smoker to control the amount of smoke in the cooking chamber. The smoker contains a porcelain coated enamel pan to contain water in it to maintain moisture inside the smoker and to keep the meat moist. A steel box holds wood chips to burn in the firebox. In order to move it easily, when required, wheels and handles are attached on the sides of the smoker. 290 square inch surface of cooking chamber is enough to cook 18 burger at a time. Structure of 48.03” x 17.5”x 44.6” measurement is made of steel black in color. Grates are coated with porcelain. Size of its warming rack is 140 square inch. Temperature control system is mounted on its lid. This Dyna-Glo DGO1176BDC-D Charcoal Offset Smoker is available in two models – standard and wide to provide enough cooking space for grilling your food as per your needs. In order to provide maximum smoke to flavor your food, the wood chip box of the smoker is made of porcelain enameled heavy gauge steel. The smoker is provided with heavy handles to handle it easily whenever required. The offset smoker has a temperature gauge to monitor the temperature easily. And you can cook up to 150 pounds of food so that you can enjoy it with your family and friends. The design of the firebox allows you to keep the heat in the cooking chamber under control to pass the smoke through entire food effectively. The smoker features a grease management system to condense the food and collect drippings to clean it easily after every use. In order to ensure its durability, the body, made of heavy-duty steel, is coated with high-temperature powder. The height of the cooking grates is adjustable allowing you to cook any food regardless of its size. The Vertical Offset Charcoal Smoker has a enamelled tray for wood chip and charcoal. Smokestack with grease and condensation management system and chimney. Temperature gauge to control temperature to give smoke flavor to the food. Design allows you to cook your food at slow heat by keeping the direct heat away from it. Easily accessible to add wood chips or charcoal due to dual door design of its firebox. Double door offset smoker has adjustable 6 cooking grates to cook up to 150-pound food of any kind. The structure is made of powder covered cold rolled steel and its grates are made of stainless steel of 400 series. Dimensions of this smoker are 47.03” x 34.52” x 20.2” and its overall weight is 57 pounds. The total cooking space of this traditional black colored charcoal grill is 830 square inch. The smoker has a Texas-style firebox with 250 square inches total capacity on its one side to make it more suitable for grilling barbecue and give smoke flavor to any food. In order to avoid warping, the cooking grates are made of non-stick cast iron. And the side firebox and cooking barrel are made of powder coated heavy gauge steel. The adjustable dampers and adjustable fire grate of this smoker allow you to control the heat more effectively with the help of the temperature gauge provided on its hood. Moreover, you can easily add charcoal to the smoker with the help of its removable drawers. These drawers can also help in dumping down the ash easily every time. The smoker with 62” x 50” x 29” and 146 pounds overall weight can be used for long as its double bottom ensures its durability. Temperature gauge, 2 wheels for easy transportation and storage rack are the other important features of Char-griller offset smoker that require assembly. Charcoal Grill contains cast iron cooking grates to provide even heating in the entire cooking chamber. The total cooking area is 830 square inch whereas the primary cooking area is 580 square inch. Temperature can be controlled at hot, medium and warm with the help of its adjustable fire grates. Allows you to add fuel easily without removing the grate entirely. The ash pan allows you to dump its ash easily. The heat gauge allows you to monitor the temperature of its cooking chamber to cook the food perfectly at the right temperature..
Fire box with 250 square inch capacity on the side of the smoker. Constructed with heavy gauge powder coated steel to give it a long lasting finish to its color. Double bottom ensures the durability of this offset smoker. Three shelves to keep all of the essentials required for grilling within your easy reach. Warming grate allows you to keep your food warm for a longer time. Char-Griller has a reputation of manufacturing amazing cookers and smokers at incredibly inexpensive prices for budget-conscious buyers. This tabletop charcoal grill offset smoker is no different, as it offers a multitude of features at a reasonably cheap price. Ideal for smoking or preparing grilled food items during camping, picnics, or simply a barbeque party at home, this portable grill can help you prepare delicious foods. You can easily carry it anywhere you want and use it safely without much effort. The body of this Charcoal Grill is constructed from heavy gauge steel while the actual grill to place the food items is made of cast iron. You can use this Grill for years without needing to replace any parts. This offset smoker also offers an incredible grilling space of 250 square inches. This allows you to smoke large quantities of foods at a single go. There is also an ash pan to facilitate easy dumping of the charcoal, thus making the cleanup process a fairly easy one. The dampers in this smoker can be easily adjusted in order to ensure that your foods do not get over-smoked. You can easily adjust the extent of heat to be let out for the food items to be smoked as necessary. This multi-utility grill smoker is ideal for you to hold barbeque parties regularly. Solid construction with heavy gauge steel body and coated with powder for increased durability. The grill is constructed from cast iron. Effective controlling of the heat using two adjustable dampers. Provision of a removable ash pan for easy dumping of the burnt charcoal. Large grill space of whopping 250 square inches. Lightweight and easily portable to all places. Can be easily connected to charcoal barrels grills to act as a side firebox. If you are looking for a charcoal grill with offset smoker for preparing scrumptious gourmet meals at home, this charcoal grill is the best option for you. Featuring a compact design and a versatile range of applications, this smoker can easily be used on patios, decks, balconies, and other such areas. The cooking grates of the smoker are made of porcelain enamel that makes them increasingly strong and durable to last for years. This also allows you to ensure proper regulation of the temperatures to cook your foods with ease. The cooking chamber of the smoker is also designed using an adjustable charcoal pan allowing better heating capabilities. One of the best features of this gourmet charcoal grill smoker, however, is the ability to attach a combination offset smoker that offers an additional cooking space of an astonishing 182 square inches. This allows you to grill larger quantities of food items at a time. Hence, this gourmet smoker is suitable for smoking large food quantities for your friends and loved ones. Moreover, you can use this piece of equipment to roast vegetarian as well as non-vegetarian food items with equal ease, making it ideal for all barbeque occasions. Once you are done smoking and roasting the delicious gourmet meals, you can simply use the removable ash pan to clean the equipment in no time at all. A total of 872 square inches of cooking area. Cooking grates made from porcelain enamel offer incredible durability. Features side doors for adding charcoals as well as removing the ash pan while cleaning. Efficient adjustable dampers allow better air flow for proper heat regulation. Professional thermometer allows regulating the cooking temperatures. Attachable combination offset smoker to allow roasting a side dish. Provision of a front table as well as a bottom shelf to offer additional space to work with. If you are looking for a combination grill and smoker to smoke large quantities of delicious food items for a number of people, the Highland Offset Smoker manufactured by Oklahoma Joe’s is the one for you. Featuring an astounding cooking space of 900 square inches, this smoker allows you to roast and grill sufficient foods for all your friends, family, and loved ones in super-quick time. It features a separate location to add flavored wood chips so that you can add your desired flavors to your grilled and smoked food items with great ease. The equipment also features three separate cooking grates that allow you to cook different food items at the same time, without the risks of them interchanging flavors. With adjustable air dampers, you can regulate the quantity of air flow in the smoker and control the eventual heat being released to the foods for effective roasting and smoking. The firebox can be easily connected to the side of the primary chamber where the food items are being smoked. Once you place the burning charcoals or wood chips into the firebox, the heat, smoke, and any flavoring wood smoke that you may add travel through a hole that connects the two separate chambers. This ensures incredible perfection as far as the smoking of your meals is concerned, allowing you to prepare delicious foods with relative ease. The construction of the grill body is made of heavy gauge steel for increased durability. Provision of multiple air dampers to regulate proper control of flow of heat and smoke. Easily removable ash pan to facilitate easy cleaning of the burnt charcoal in the firebox. Incredibly large cooking area spanning over 900 square inches. Convenient access doors to add charcoals into the firebox or remove the ash. The spring handles are chrome-plated to ensure that your hands are safe from getting burnt. Provision of a metal shelf at the bottom gives you added working space while cooking. The Outsunny Backyard Charcoal Barbecue Smoker and Grill Combo is an ideal product for both amateur grillers, who are still learning the basics and veteran backyard chefs. This Charcoal Barbecue Smoker and Grill Combo has two openings, separated from each other, one for the grill and the other for its offset smoker, which gives you the best backyard experience. The Charcoal BBQ Smoker and Grill Combo come with an easy-to-read thermometer that makes sure that you don't have to open the lid in order to check the temperature. Additionally, there are two shelves – one located on its side and one in its front. It comes with two openings, which allow a superior backyard experience. An easy-to-read thermometer helps in keeping a check on the temperature. There are wheels that make it easy to move. This Outsunny Backyard BBQ Smoker is lightweight and can be moved around easily. Charcoal Smoker and Grill Combo is an ideal choice for anyone who wants to start cooking outdoors. Furthermore, the easy-to-read thermometer will make your cooking easier. You can enjoy quick and easy gas grilling with Char-Griller 5050 Duo. You can also enjoy slow cooking with this all-in-one BBQ smoker. It offers 1260 square inch space for barbecue grilling and smoking. In addition to this, this grill also features 438 square inches of cooking area. It comes with porcelain-coated grates of cast iron, electronic ignition, one 12000 BTU side burner, three burners with a BTU output of 40800, and dual-smoke stakes. The Char-Griller 5050 Duo also comes with 580 square inch cooking area, double lined bottom, adjustable fire grate, and easy cleaning ash pan. This smoker also comes with a durable body and two-fuel options for flavor and convenience. It also comes with dual cooking surfaces – one gas and one charcoal. Both the gas and charcoal sides feature in-built temperature gauges and warming racks for additional control. It offers charcoal and gas grill combo. You’ll get a cooking space of 1260 square inches. The grill comes with an adjustable grate-height for additional temperature control. The heat gauge is made of stainless-steel. The grates are porcelain coated and made of cast iron. This Gas & Charcoal Grill comes with an easy to clean ash pan. Char-Griller 5050 Duo Gas & Charcoal Grill offers a convenient and superior cooking experience. This smoker comes with a heavy and durable steel body with an underneath shelf and a condiment basket that offers additional storage. This Gas & Charcoal Grill also has wheels for better mobility. The Camp Chef Deluxe Pellet Smoker will help you in taking outdoor cooking to a whole new level. This grill smoker BBQ is designed with many outstanding features that not only simplify the cooking, but also make the overall experience of outdoor cooking a pleasant one. This Pellet Smoker BBQ and Grill is designed keeping in mind the home griller. And because of its inbuilt features, the process of smoking is simplified to a large extent. It’s an advanced digital temperature probe that makes the cooking process simpler. Besides, the digital temperature provides a steady temperature and smoke that eliminates large swings of temperature to give you a consistent temperature for cooking. Additionally, it comes with a patented system of ash cleaning. It comes with an advanced digital control. You can barbecue, braise, roast, bake, smoke, and grill with it. It also offers a huge area of cooking. The patented ash cleaning system makes this smoker BBQ and grill easy to maintain and clean. The Camp Chef PG24 Deluxe Pellet Smoker BBQ and Grill is an award-winning BBQ grill and smoker that will give you the best cooking experience. You can now hold big parties as this smoker offers you a pretty big area of cooking. Moreover, this Pellet Smoker is simple and easy to use. One doesn't need to have any technical knowledge to operate this grill. Anyone can use it with ease. You can now expand the horizons of outdoor cooking with the Dyna Glo Signature Series. This outstanding and multifunctional smoker can convert into one grill and offers you flexible options for cooking. You can use it as an offset smoker and grill. This smoker comes with one removable ash pan and an offset grate that offer you the options of easy disposal of ash and convenient access to fuel. The offset cooking and smoker grates will offer maximum space for searing and heat transfer. You can now diversify the range of your cooking with the Dyna Glo Signature Series. It offers a large cooking space of 1382 sq. Total space for offset grill cooking will be 284 sq. This smoker and grill come with a construction of durable heavy gauge steel body. This smoker comes with five chrome-plated cooking grates made of steel. The Dyna Glo Signature Series DGSS1382VCS-D is an excellent product that gives you the full value of your money spent. This product offers an excellent design along with durability. Moreover, the compact Dyna Glo Signature Series a very beautiful product as well. There are several other offset smoker machines out there. However, the ones discussed above are sure to offer you great value for your money and make your barbeque experiences enjoyable and incredible. Before discussing different types of smokers used for barbecue, you must know what is meant by the terms barbecue and smoker? The term barbecue can be used in various manners. Barbecue can be defined as a process of slowly cooking tough pieces of meat, especially pork or beef, on smoke emitting low heat. The tough connective tissues in these pieces of meat break down into sugar and water, and fats melt to keep them moist through this slow and low cooking process. A barbecue smoker is an appliance used for outdoor cooking that helps in maintaining a low temperature for cooking for a long time period. It produces the smoke and holds it around the meat to get absorbed. A smoker that provides necessary space to barbecue the meat efficiently is considered the best. This smoker has two parts. Its main cooking chamber is a long metal grated box or barrel with a smokestack and long lift door. There is a firebox, attached to one end of the cooking chamber, which has an adjustable vent and an access door on its top or side. The firebox creates heat and smoke to supply into the cooking chamber through a small hole in between them. You will also find a jerky smoker, especially in the market. The barbecue smokers of this type are popularly used for outdoor barbecue. The main reason for their popularity is their inexpensiveness. They are comprised of three compartments. Their bottom compartment works as a source of heat. While the middle compartment has a water pan to regulate the heat and maintain a moist environment for cooking meat. And the top chamber is the smoking chamber where the meat is cooked and infused with the smoke created in the bottom chamber. Drum Smokers are also known as Barrel Smokers. These smokers are popular among barbecue lovers due to the simplicity of their use along with their inexpensiveness. These basic smokers are made of steel with a cooking rack on the top and firebox at the bottom. There are vents on their lids and base to adjust the internal temperature along with preventing the leakage of smoke by sealing them. These smokers are just like drum smokers as they also have a cooking chamber at the top and source of heat at the bottom. The only difference between them is that box smokers are insulated to prevent leakage of heat from them. Charcoal smokers are also just like drum smokers as they also have a cooking chamber at the top and source of heat charcoal chamber at the bottom. There are many different types of charcoal smokers available in the market. You will also see Bullet Smoker, Ugly Drum Smoker, Kamado Grill, Vertical Smoker, Pellet Smoker, Gas grill-smoker, and Ceramic Smoker in the market. Smoking is a very interesting process of cooking and flavoring by exposing the food to smoke. Mostly, meats and fishes are the foods which are smoked in different types of smokers. Also, other dishes of vegetables and cheese are smoked. But before doing anything, it is essential to get a perfect smoker that you can use efficiently for smoking. There are mainly two types of smokers widely used. One is the offset smoker used traditionally and the other one is an electric smoker which is invented recently. There are many differences in an offset smoker and an electric smoker. These differences should be considered while purchasing and one should be aware of their specifications. Firstly, you need to prepare a chimney starter and light the charcoal. After that, you need to wait until the temperature is set right and then pour in the briquettes in the smoker box. Once you start smelling and seeing the smoke from the wood, take care of the temperature. After this, you can add on your meat or anything else and rotate it till it cooks. Don’t over smoke the meat and keep adding wood chips. Firstly, you need to add some water to the water pan for keeping the temperature stable. Then, you need to add wood chips or chunks to the electric smoker. After this, turn on the smoker and set it to the desired temperature. Wait until you the get the smoke. You can now add your meat by opening the smoker’s door. Do it quickly and get the doors closed immediately. After the meat is smoked nicely, you can get it out as it’s all done. In terms of convenience, an electric smoker is always preferred as there is no mess at all. An offset smoker requires patience and you also need to worry about setting the temperature. The flavor that comes from the traditional offset smoker is something that is really tasty and smoky. It is definitely worth the wait as compared to an electric smoker that gives a good taste, but not a smoky flavor necessarily. If you are looking for an affordable one, it is better to go in for an offset smoker. You will just have to pay a little initially and then buy the wood chunks for smoking. Electric smokers are expensive due to the additional features and the convenience it offers. Offset smokers usually need a big space and are often used outdoors. On the other hand, electric smokers can be used indoors with no wood fires to disturb around. As it is with every electric device, they need repairs and replacement of parts. An electric smoker may need repairs but in an offset one, you need not to worry about it. Although both the smokers are good enough, the selection depends on various factors. Offset smoker is a classic type of smoker that is quite popular among the people. The design looks quite vintage-type with a classic outlook. Many people nowadays wonder how the offset smokers work and their advantages. Although the design is quite classic, it is designed in such a way that it can control maximum heat and maintain a stable temperature. They are generally quite heavy in weight and thus most of the models come with wheels or casters. So that, you can easily move it from one place to another. It comes with a long horizontal chamber for smoking food. Besides, it has a small firebox attached to a side for burning charcoal and small woods. Once you put the meats into the horizontal chamber, you have to set the fire too in the small firebox. There is a door beside this firebox to control the flow of oxygen. The more you keep it open, more oxygen will flow inside which will increase the temperature of the cooking chamber and vice versa. It also comes with a chimney at the top to release the extra smoke from it. Besides, there is a lid that can be closed to raise the temperature of the chamber. When the chimney is closed, the smoke cannot escape and the temperature increases. There is also a machine that shows the present temperature of the cooking chamber. If you want to increase or decrease it, you have to control the firebox door and the lid of the chimney. The cooking process is quite traditional, but it gives a perfect smoky flavor to the foods. You can add charcoal, wood chips, or logs without even opening the cooking chamber. You can even stoke the fire if needed. Most of the units come in such a way that you can use it for grilling directly in the firebox by installing a grill grate over it. It offers a large area for cooking in the cooking chamber making it easier for you to grill a large amount of food at a time. There is no electrical circuit in this design that will ever need a repair or replacements. No mechanical and electrical parts are used. You will also get a lot of options for customization according to your own needs from different brands. So, this is all about the offset smokers that is quite traditional in design, but it still has maintained its popularity among people. The offset Smokers have turned into one of the key items of the modern kitchen. It is definitely a wise move to invest in these items as it keeps the kitchen healthier and enable you to cook delicious foods. If you are wondering how to set up and modify an offset smoker, paragraphs underneath shall answer this question. So far the setup is concerned, the most important point to keep in mind is that you should use charcoal as the cooking fuel, instead of wood. It is for the reason that the wood fire goes out of the control of this equipment and can trigger awkward instances. Likewise, using wood, you will end up producing an excess of smoke and ash that is likely to damage the mechanism. To enhance the efficiency of the system, it will be wise to install 2 good quality thermometers along both the terminals. This setup will enable you to keep the temperature of the mechanism while working within your control and hence, it acts as a protective mechanism for the setup. As these machines are made with metals, it is obvious that it will keep on catching rust. Hence, to safeguard the device, you should make arrangements to keep it covered while it is not in use. This will enhance the lifespan of the mechanism. Thus, you can expect to get better values in return for your investment. You should ideally add a duct, a convection mirror, or a deflector that will enable you to win over the challenge of dissipating the system due to the variation in temperature inside the cooking chamber and other parts of the machine. The chimney needs to be extended downwards. You should enhance the capacity. Adding a water pan along the fire chamber will be a smart move to prevent excessive heating of this part. The tricks and tips discussed about the setting of the Offset Smoker and its modification will assist you to complete these steps without getting into hassles and troubles. Most importantly, sticking to these simple steps, you will be able to enhance the efficiency and lifespan of the Offset Smoker. Everything we use in our day to day life has its own pros and cons. Similar is the condition with an offset smoker. On one hand it provides you delicious smoked foods cooked at low temperature, and on the other hand, it poses a number of dangers for you. Brief information about the safety concerns of an offset smoker provided here will help you use an offset barbecue smoker carefully. All types of foods are prone to be infected by bacteria at any temperature from 0 degree to as high as 165 degrees F when the heat destroys them completely. Your food cooked in offset smoker can be contaminated with bacteria any time between these two temperatures especially when you are going to store the leftover food after serving it for the first time. You should use it next time carefully as it can cause various health problems like flu or food poisoning etc. It is another matter of great concern while using an offset smoker as it can destroy anything if not controlled efficiently. So, while using a smoker you should learn to control fire along with keeping a fire extinguisher near you to use it as soon as possible if required. The offset smokers that work on charcoal are more dangerous than those working on gas or electricity. On one hand, charcoal is not easy to light up and on the other the liquid used to light them can produce heavy gases even at a low temperature which can affect the quality of your food. If your offset smoker runs on gas then an obstruction in the path of fuel can cause havoc. This blockage can be anywhere in your smoker. So, you should check it regularly, especially before using it to avoid any untoward situation. The smoke of your offset smoker can also be dangerous for your clothes, hair, lungs, and eyes. So, you should smoke your food carefully. Moreover, the smoke of your smoker also contains various dangerous elements like Polycyclic Aromatic Hydrocarbons or PAH, and carbon monoxide, etc. that can cause fatal health problems like cancer. So, you should use it carefully in an outdoor location to reduce its impact directly on your health. Thus, there are several matters of concern while using an offset smoker for cooking tough pieces of meat or any other grilled food. You should use it carefully to avoid any chaotic condition later on. Do you want to know how to take care of and clean your offset smoker? Are you looking for some effective tips to use your smoker for a long time? There is no doubt that a proper maintenance will ensure durability of any product. If you want to use it for a long time, you will have to take care of it from day one. All the smokers are not the same. Some might need more maintenance and periodic repairing. But all the smokers need some basic maintenance and cleaning. You will have to clean your smoker regularly to improve the performance and to avoid early damage. Regular cleaning means you will have to clean it after every use. Before planning to clean your offset smoker, first, you need to go through the instructions written in the manual. All the materials are not the same. Some need specific attention. Go to the manual for the instructions. Use cooking oil inside the surface. Heat the smoker to a temperature of about 250 to 275 degrees F.
You can use any oil from the Pam to the Peanut. The type of the oil will not make a big difference. You just need to have a good coating of oil that will cover the surface of your smoker. That will work as a barrier and will protect your smoker from rusting. While heating, make sure that the temperature is not above the given range. Any high temperature can damage the material. Even if your smoker does not require seasoning, you can simply fire it up once before the smoke. It will eliminate any contamination from your smoker. It will also build a protective layer over the cooker and will prevent the rust from building up. Make the place properly ventilated and ensure that you are not getting a layer of creosote. You can get this substance in the poorly ventilated smoker. You can maintain the protective coating of your smoker by keeping the ashes and any food builds up out of your smoker. You should not scrub the metal. You just need to clean it regularly to maintain the smoky and oily surface. Regular cleaning will also prevent the rusting. You should not allow the ash to sit for a long time. While cleaning your smoker, always take care of the rust. You should remove it immediately whenever you notice the appearance. After the cleaning, if required, paint it with the heat-resistant barbeque paint. You can use best quality paints for the better result. An offset smoker or grill is a device that primarily aids in cooking meat. It does not basically utilize a traditional cooking method over the flame, but instead cooks meat over the smoke rising from burning wood or charcoal. If it’s needed to grind meat, you can use a meat grinder; it will reduce grinding cost and time. Then, meat or any other food is placed on the cooking stand. This stand is kept away from the direct flames and the food is cooked solely by the indirect heat and smoke. In this way, flavor is added to the food. Fresh coal and wood pieces need to be added to it to keep the smoker running. Add light charcoal to the chimney starter. Put lit coal in the intake and chimney baffles. It is crucial to allow the heat to take its time to come up to its potential before you start smoking your food. Importing moisture to the smoke also gives it a perfect blend of taste and color. The usual temperature needed for cooking is around 225 degrees F or 107 degrees C.
The very first important step here is to maintain the temperature and control it well. Keep the chimney and intake vent wide open. This will facilitate in and out of air and smoke from the smoker. When you start seeing and smelling the smoke from your wood, it is time to bring in your meat to be cooked. Arrange your meat pieces on the proper grates of the grill and start cooking. Make sure to keep rotating them at regular intervals in order to avoid overcooking. Keeping the intake vent closed will limit the supply of oxygen which is mandatory for the fire to burn. The absence of oxygen will cause the fire to burn more slowly and hence delaying the entire process. If both vents are closed, the temperature will soar up inside the smoker overcooking the meat. This will cause black soot to form on the food thus spoiling its flavor and look. Hence, you should never leave the temperature unattended lest you want to destroy the food. It is advised to switch between charcoal and real oak wood or you can also try a combination of both. Smoked meat is a popular delicacy in many cuisines. The main advantage of such a way of cooking is that it retains the nutrients in their natural form. Especially for protein-rich foods, this is the best way of preparation and consumption. Keeping aside the health factor, this also additionally imparts flavor and a delicious coal taste to the meat. Various types of beef, pork, lamb or chicken can be prepared this way. It is one of the best ways to get fussy eaters to have their meal and not complain about the taste. Different combinations of wood can be tried to enhance the smokey flavor of the food. In an offset smoker, chunk and logs of wood, and coal can be added without opening the chamber. Not to mention the fact that these smokers do not need replacement of any electrical or moving parts and they can cook large chunks of meat at a time.